The last presence with her--hours before my flight--Jan, 08. Its been 10months since she left, but it still feels like yesterday. It is hard to look at her pictures sometimes; but when I look at these pictures, it just reminds me of the last fun days with her. The pictures were taken last December 2007 and early January 2008. One of the most difficult day was getting the call on one morning in late Feburary from Nigeria that she has passed away. I still couldn't believe it because I couldn't believe this person I love and just spoke to couple days ago is no longer with us. I remember talking to her two days before she passed, she sensed I was tearing up and she pleaded that I should stop crying and that everything is in control. She continued by saying, "God is in control, keep doing the good things that you have always done". At the end of the conversation, I remember telling her, "I love you" about twice because the phone signal wasn't that clear, and she responded despite the effect of the medication she had and how sleepy she was, she whispered back, "you know I love you". This last words just forever rings in my ears when I think about her. I am not going to lie, I still can't write or talk about her without a box of kleenex beside me. Even the thought of visiting Nigeria this Decemember knowing that the main person I go there to see, will not be there or the fact of coming across some of the items she wanted me to get for her this xmas, but I can't get it anymore, its a bit sad. Today this beautiful lady, my lovely grandma, would have been 89 years old today, so I am celebration this phenomenal woman--Mrs. Susanna Dillibe. awww. i've learned people really need to appreciate the ones they love while they can. your post re-reminds me to do that! thanks! memories are what keeps us going. i too have a grandma and am always very scared to get a call like that soon but i dont want to think about it yet. Stella darling Big Hug!!! 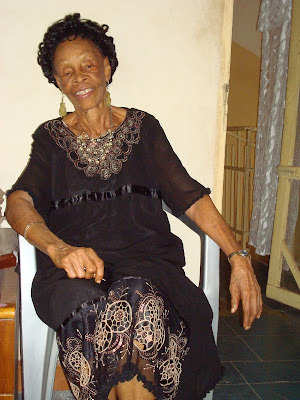 what a touching post,my sweet May your beautiful Granny's soul rest in perfect peace. It is beautiful that youyr celebrating her life and all that she meant to you. My Grandma died in early oct this year soI know the pain you feel. May God comfort you and your family at the mark of her birthday. Time heals all wounds. Don't you love grandmothers?? I miss my grand and greatgrandmothers all of the time. May your grandma be eternally blessed and at peace. ps- Have a safe trip to Nigeria!! Sweetheart I understand everything you are going through. I lost my mother in April and my son (who is 18) lost his grandmother as you did your. 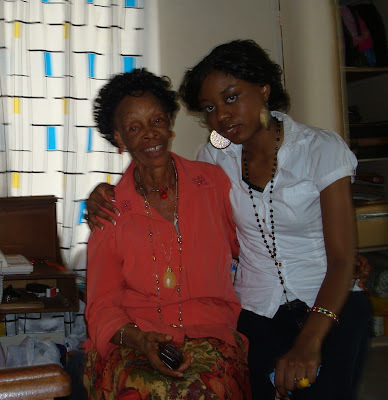 It has been very hard for me and not a day goes by that I don't shed tears over the lost of my mother. My son misses her dearly. She was a beautiful and special person just like your grandmother. But your grandmother was right "God is in Control" and I know my mother felt the same way too before she left this earth, because she knew she was leaving. The memories now are so precious and we just got to keep those alive. We are still in the grieving process, so you got to let it out. They are resting now and you as well as my son have the honor of keeping your family name and memories of those you loved alive! It is being handed over to the next generation - YOU - so be strong for your family and the legacy Mrs. Susanna Dillibe left behind! @charmain: thanks dear, so agree, we sometimes not remember or value as much as your families. thanks that i inspired you. @closetcolumnist: thanks a lot, we all LOVE grandma. i appreciate your comment!!! My dear, I can imagine how you feel, I lost my dad 5 years ago and I still miss his presence. What a beautiful tribute you've done to your grandmother, so sweet. And what a gorgeous lady even in her last days. May God confort you and all your family and remember that she must be in peace and taking care of you as an angel. @jen: thanks a lot dear!! @the seeker: thanks for such beautiful and sweet write up, its always hard forgettig love one who have passed. THANKS a lot, really appreciate your kindness and love. HAPPY BIRTHDAY TO YOU MOM!!! that is so lovely and sweet. losing people close to you is so hard. i have a dress and some accessories that my mom used to wear that i always wear in her honour. and i like to think they live on through us..
@SOS: YEAH, Pretty hard losing loved one, remember fun times with them is great, thanks for the sweet word. must be nice having a piece of your mom. @ryder: really appreciate it, thanks a lot!! what an awesome and beautiful grandma you had! happy birthday to her! What a lovely tribute! Happy bday to Mama and happy turkey day to you!! @CC:thanks dear, have a save and wonderful thanksgiving too!!! @SC: thank hun, you always come with such sweety and warm comment. have a happy holiday!!! you are very preety and i liked your blog! Such an inspiration reading this post, because honestly, my grandmother passed away two weeks ago... we were very close. Goodbye is never easy, there are never the right words to say, never enough time... but when the ones we love leave us, I think it's what we hold onto that keep their memories alive. This is a great song. I love this song and my nieces listen to this alot after their grandmother (my mom) passed on.